We are excited to announce that WiSys Agility Build 567.2 is now available! This is a patch release. Please visit our Build Release Notes to review patches and bug fixes included with Build 567.2 This release includes the NEW WiSys Agility Label Designer, approximately 50 bug fixes and 10 enhancement requests. 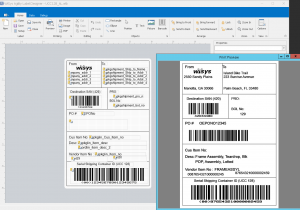 Agility Build 567.2 includes the release of our NEW label design tool – Agility Label Designer. We created Agility Label Designer to replace NiceLabel for all your labeling needs. Customers with an annual paid maintenance can start using Agility Label Designer for FREE! Standard, out of the box labels are included to help you get started. You can also create your own custom labels to meet all your labeling requirements. Watch this Learning Lab webinar to see how to start utilizing Agility Label Designer. Agility Label Designer is a .NET NeoDynamic product that is embedded in Agility. It can run as a standalone application and is also imbedded in Form Studio and Design Studio and supported within Document Manager. F1 help has been added to each component application and links directly to our online support documentation. This gives you the ability to add your own link to documentation for your tailored applications. This could be a documentation site, Synergy or a network line to the document. See F1 Help in action. NiceLabel 2017 does not work in WiSys and will not be supported. NiceLabel 2017 runtime was changed to be sold by printer based pricing. This would have required WiSys to track each customer’s printers for NiceLabel utilization and charge by the printer. We felt this change eliminated our ability to distribute the runtime successfully in a cost effective or unlimited use ability to our users. NiceLabel version 5 and 6 labels will be supported until there is a compelling event such as an operating system update or system change out of our control that will cause the runtime to stop working. NiceLabel no longer supports version 5 and will end their support of version 6 on December 31, 2018.